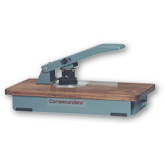 These Hand Held Steel Corner Rounders are convenient and economical and made to last. They are made in the U.S.A. and are Sturdy all metal construction. 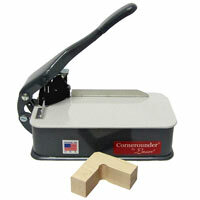 The Lassco Wizer CR-20 Tabletop Corner Rounder is a convenient, economical corner cutter. It has a sturdy aluminum construction and an unbreakable plastic top-plate. 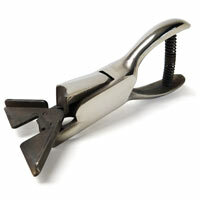 The CR-20 has interchangeable corner cutting units that come in sizes 1/8", 1/4", 3/8", or 1/2". With the CR-20 you are able to corner round up to a 1/2" of a material. Convenient, sturdy tabletop corner rounder. Sturdy metal construction with a laminated wood top. Extra dies for our Tabletop Corner Rounder (01CR) and Heavy Duty Tabletop Corner Rounder (01HDCR). 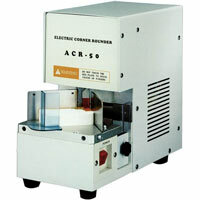 Heavy duty tabletop electric corner rounding machine. Extra knives for our Heavy Duty Electric Tabletop Corner Rounder (01HDECR).